Experts have dismissed the claim that a 104-year-old foul-mouthed parrot once belonged to the war leader Winston Churchill. 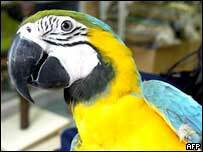 Charlie, a blue and yellow macaw, is spending his twilight years in a garden centre in Surrey but his owner Peter Oram says the bird used to live with Sir Winston Churchill in his heyday. Mr Oram claims his father-in-law Percy Dabner sold Charlie to the former Prime Minister in 1937 and then took the bird back after his death in 1965. The bird now entertains customers at the Heathfield Nurseries, in Reigate, with a string of obscene anti-Nazi tirades, which Mr Oram claims Charlie picked up from Churchill. But the Churchill family have questioned Mr Oram's story and historians have said they are unsure if the leader ever owned a parrot. Staff at the National Trust's Chartwell property, Churchill's former country home in Kent, said they had conducted a thorough search of records and photographs but could find no evidence of him ever owning a parrot. Judith Seaward, marketing manager at Chartwell, said: "We really looked and looked and know he had a budgerigar and all sorts of other animals. "He loved animals, he had dogs, cats, pigs - but there's no record of a parrot. "We have searched what we've got here and spoken to members of the family who I really thought would have known." Staff at the nurseries were standing by the bird on Tuesday and defending his claim to fame.